Wherever this boat goes, it is certain to turn heads. A power cat that has the wow factor, it is ideal for either weekends away with family and friends, or for offshore fishing. It can really do both very well. The design and list of possible options are well thought out, as they were developed by people with years of on-water knowledge and experience. 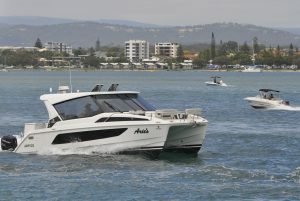 A really large boat with very nice handling, this is the Aquila 36. Queensland’s first local owner is Arie Goddaer, who recently ordered his A36 as an offshore fishing platform. 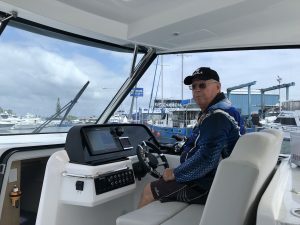 Arie was generous enough to take us out on the Gold Coast Broadwater and through the Southport Seaway for an enjoyable ride. The A36 has a fabulous amount of room above and below deck. It is a big-volume open-bow catamaran, offering the comforts of an overnight cruiser with two well thought-out cabins for up to 4 adults. “This boat is not too big and not too small. Just right for our crew of two. And the walk-through entry doors on either side of the hull means my wife can easily set our fenders and lines when docking,” confirms Arie. The southeast Queensland waters are notorious for sand banks. The A36’s shallow draft of just 60cm and the outboard engine configuration make it possible to motor around without fear of touching bottom. “We can anchor up close to sheltered shores. We often go to Peel Island and Moreton Island. But wherever you want to go it’s going to take you there very nicely,” explains Arie. Aquila prides itself on continually improving the clever boat designs by listening to suggestions of existing customers and collecting opinions from the international sales channel. 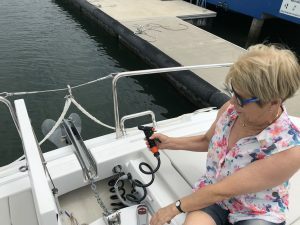 Every model has progressed with some subtle and sometimes major enhancements that maximise the practicality of the boat and improve the boat user’s experience. Beyond its nice handling, this boat is more than capable of hosting up to 20 guests, all while seated, with 12 seats facing forward. There are many little hidden features that make a big difference in the design throughout the three main entertainment areas. For one, the floor is slightly angled to the aft and centre so that water can flow through, which makes washdown really easy. The chic quality fixtures utilise heavy-duty stainless steel fittings and hinges. There is a selection of stylish colour scheme upholstery with contrast colour UV-resistant threads. Lorraine and Arie are happy with the standard feature light grey and charcoal upholstery, and we agree. To accentuate the interior hull design, stainless steel arm rests and drink holders have illuminated lighting. Storage spaces are accessible underneath all seating. A huge hardtop overhead has courtesy lights around the perimeter. An electric sunroof is an option, but Arie did not order one as he wants to keep out of the sun. A folding seatback allows passengers to sit facing ahead at the forward console seating. There are well thought out air-conditioning outlets, as well as USB and accessory plugs added to each seating position, and 240V outlets throughout. There is even an elevated tow point for towing wakeboarders wanting to get air while jumping. There is plenty of storage in the galley alongside a fridge/freezer. The wrap-around grab rail ensures your stability. The bench tops have raised edges so items will not slip off. Arie’s boat has an induction cooktop, a deep sink as well as having enough space for Arie’s counter-top microwave and LCD TV. The dining area has an L-shaped settee around a collapsible table, surrounded by handy flat surface storage space and a self-draining insulated storage under the seating. The cabins are accessed by doors in the centre walk-through, and the doors conveniently slide forward into the bulkhead. When entering below, it feels very spacious with a 1.98m headroom. The double berth has a side window the length of the bed that has pull down blinds, and overhead hatches fitted with a screen for insects, allowing natural sunlight into the cabin. “During the day, the cabin is bright and cheerful. The air-condition vents keep the cabins cool even when the doors are open. There is ample storage on the shelves on the side and ahead, and drawers underneath the bed,” Lorraine points out. To the aft bulkhead are the electrical panels and a door to the toilet. The toilet has natural light from a full-length window and an opening porthole for ventilation. A tap head pulls out to double as a shower head. All of these useful features are exactly the same in the opposite side cabin. The adjustable helm seat can slide forward, and has a push-up bolstered seat cushion. There is also a comfortable footrest. With two 250 Mercury Verados fitted with the standard 3-blade Enertia propellers, there is plenty of power to get the A36 on to the plane. Out on the water, this boat just continued to impress, with a comfortable 18-knot cruising speed. A swim platform is accessible via a transom door. Arie uses the utility cabinet as an aft-facing bench seat while waiting for a fish. There are flush-mounted pull-up cleats that eliminate any toe stub. A neatly tucked-away swim ladder with pop-up grab rails is deployed on rollers. An electric version is an option, too. There is also a fresh water shower and stereo remote, and davits can be added to carry a tender. The Aquila 36 offers many possible options. This particular model comes with the full windscreen, but there is a version with clears between the windscreen and the hardtop. The A36 is built to survey and can be registered as a commercial vessel. When fitted with an optional electrically controlled windscreen hatch the boat makes an ideal tropical island transfer vessel. 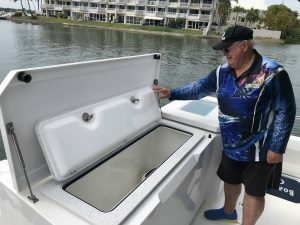 For commercial operators, a new dive boat option exchanges transom seating for dive tank holders. Under the floor is designed for easy systems access, which is useful for an owner-operator. There are two independent aluminium fuel tanks, a fresh water tank, black water tank, and a diesel generator. Arie has fitted an additional 400-litre fresh water tank for long journeys. So many great options, yet Arie chose not to take up the option of a factory-applied graphic hull wrap, as he believes the boat looks great all white, featuring only the boat’s name, Arie’s. Clearly, these boats are built with outstanding comfort levels and a load of innovative features to make boating easy and relaxing. An on-water evaluation is sure to impress, and as we found, a great deal of fun.